CheerUp is a theme with luxury design options, tailored to be exceptional on all kinds of blogs and minimal magazines. 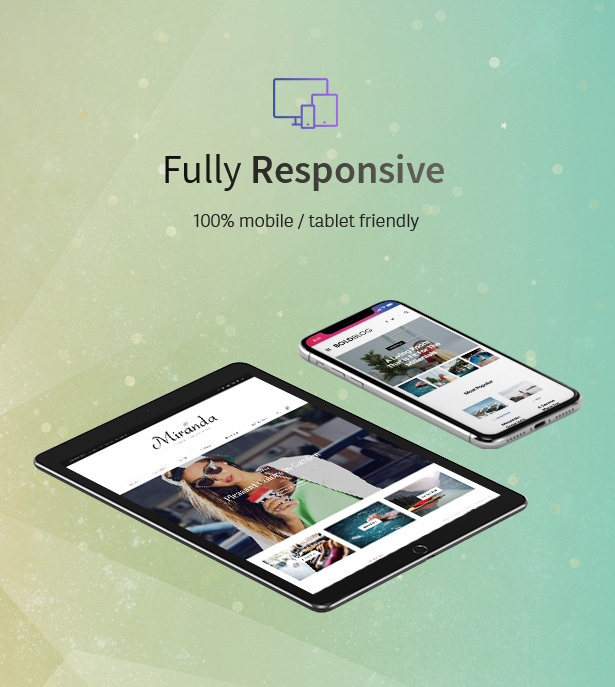 Not only the built-in modern design choices are aesthetically pleasing, it’s packed with over 1000+ possible layout combinations suitable for blogs and elegant magazines. 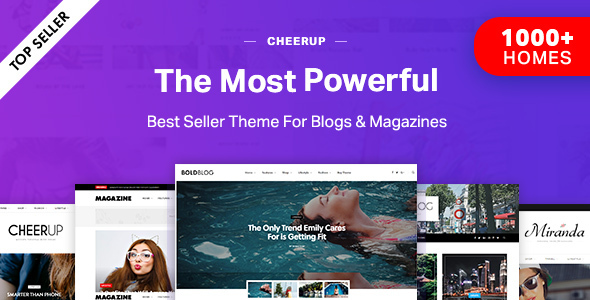 Get CheerUp today and never be bored of your blog again! Shop / WooCommerce Support Built-in. Fully Responsive design with High Definition Retina graphics. Elegant and unique Featured Sliders – choose from 10 sliders. Built-in Custom Widgets for perfect blog. Performance features like LazyLoad & Free Performance Guide. Free Updates and new blog features. 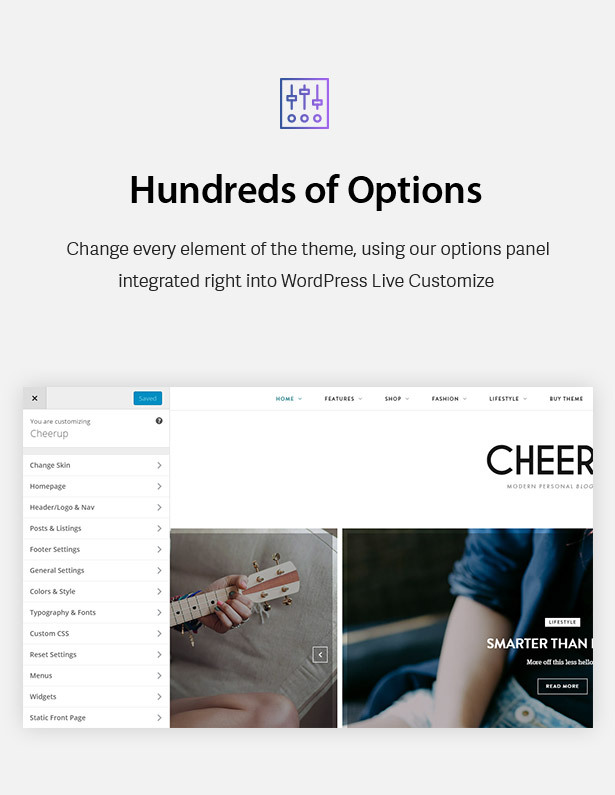 If you ever get stuck with setting up CheerUp with your WordPress installation, you can get in touch with our friendly and dedicated support via our Support Forums. - Bunyad AMP updated for Gutenberg v4.6+. - Further Gutenberg backend improvement. - Changes to allow main file overrides via child theme. - Fixed: Columns bit quirky, and other issues with Gutenberg v4.5.1. - Fixed: AMP issue at hosts using outdated 10 year old libxml library. - Improved styles for dropcaps on Edge browser. - Fixed: Slider post count issue when set via page options. - New Lifestyle Demo for blogs and magazines. - AMP Support Added - with look maintained as normal responsive. - Full Gutenberg Styling and WordPress v5.0 support. - Added: Spacious - a dynamic look option for all post layouts. - Added: New Header Style: Header 10. - Added: New Footer Style: Bold Light. - Added: New slider block in pagebuilder. - Added: Grid style option for blocks. - Added: New styles and options for Floating Social Share. - Added: Full-screen Search Modal option for header 5, 8, 9, 10. - Added: A classic Author box style option. - Added: VK, LinkedIn, Tumblr for Floating Share. - Added: New style option for floating share. - Added: Heading color option for page-builder blocks. - Added: Enable/disable counters on large posts widget. - Added: Enable/disable image on posts widget. - Added: Option to make logo use an H1 on home. - Added: Compatibility and styling for all core WordPress 5.0 blocks. - Added: Set excerpt length for blocks - grid, list. - Added: Design tab in builder blocks for spacing adjustments. - Added: Gutenberg Galleries with all options supported. - Added: Blocks in Gutenberg - alignwide/alignfull support (in full width). - Improved: Smart sticky performance for several headers. - Improved: Custom Google fonts no longer use @import. - Improved: Smarter Sticky Social Share. - Improved: Images aligned left/right wider on mobile. - Improved: Dynamic full width spacing and styling. - Improved: Skin fonts only loaded when needed. - Improved: WPBakery front-end editor view. - Improved: Parallax performance with updated lib. - Improved: Backend editor styling. - Improved: Miranda skin default fonts optimized. - Improved: Lazyload even with missing srcset. - Improved: CTA widget blurry on Windows 1x displays. - Fixed: Pinterest hover in Gutenberg. - Fixed: Facebook follow counter requiring FB app approval. - Fixed: Redundant defaults saved in options. - Fixed: Parallax issue on Edge 17. - Fixed: Multiple Load More on same page for some webhosts. - Fixed: Some typography & color options not affecting skins. - Fixed: Jetpack comment subscribe boxes. - Cleanup: Outdated placeholder and tooltip JS. - Updated WooCommerce template files for v3.5.x. - Updated WPBakery Page Builder to latest version. - Several new options and hundreds of CSS improvements. ------------ - New GDPR Guide in documentation. - New Self-Hosted Google Fonts plugin. - New Consent Popup for Mailchimp plugin for subscribe widgets. - Added: Compatibility for WP v4.9.6 Privacy page. - Added: Consent for comment forms with WordPress v4.9.6. - Added: WooCommerce 3.4 compatibility. - Added: Shortcode support to header ads. - Improved: Pinterest sharing now uses post title for description. - Improved: No IP logging for "Likes" anymore. - Improved: Comment form on mobile devices. - Fixed: Load More on Classic listings. - Fixed: Instagram followers counters. - Fixed: Author box social icons in profile edit. 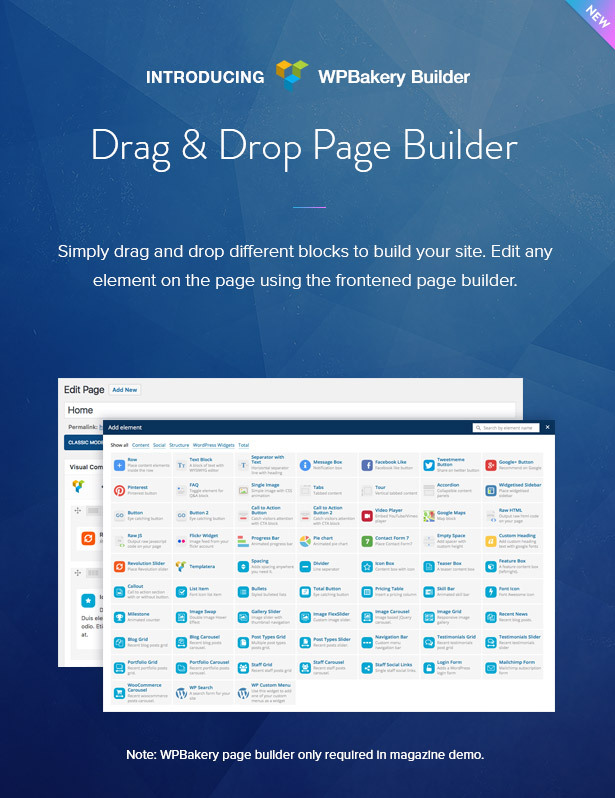 - WPBakery Page Builder updated to latest version. ------------ - Improved: WooCommerce v3.3.1 mobile layout. - Improved: Text widget style for lists & headings. - Fixed: Post format icon alignment on latest VC. - New Fashion demo with extra chic look and feel. - New Fitness demo featuring a sleek and smart look. - New Mom / Parenting demo - a vibrant style for moms. - Feature: Beautiful Fashion slider with modern animations. 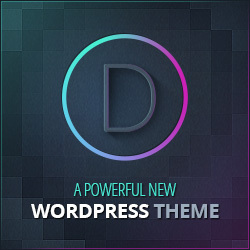 - Feature: Stylish Large post style: Half Overlay. - Feature: Enable/disable VC page title. - Feature: Footer copyright shortcodes supports. - Feature: WooCommerce v3.3 compatibility and fixes. - Feature: Compatibility with upcoming Autoptimize version. - Feature: More options to show/hide meta in posts widget. - Improved: Posts Carousel design with few new settings. - Improved: Mobile spacing of header/slider for several styles. - Improved: Smarter Next/Previous to appear at right time. - Improved: Design of List Style 2 on larger smartphones. - Improved: VC responsive column control enabled. - Fixed: List post meta incorrectly using global settings. - Fixed: Sticky header issues on some devices. - Fixed: Load More for list block when masonry is active. - 50+ design and 8+ performance improvements. - WPBakery Page Builder updated to latest version. - Fixed: Typography customization issues on WordPress 4.9.1+. - Improved: Lazyload mechanism for slower networks. - WordPress 4.9 compatibility improved. - Improved: WooCommerce affiliate products button. - Improved: Autoptimize performance when activated. - Improved: Updates for integrated plugins. - Fixed: Parallax issues on some iOS devices. - Fixed: Load More for masonry posts. - Fixed: TGMPA warning on plugin updates. - Notice for Endurance Cache plugin. - New Bold Blog Demo & Skin. - Feature: Bold Slider with smooth Parallax effect. - Feature: New Header Layout - Simple Modern Header. - Feature: New Footer Layout - Bold Footer. - Feature: Creative Large Post Style with Parallax. - Feature: Performance - Custom Optimized Lazyload images. - Feature: Creative "Next/Previous" navigation for article/Previous. - Feature: Pinterest on mouse over to images with options. - Feature: Floating/sticky sharing buttons on post pages. - Feature: Posts Slider widget for the sidebar. - Feature: Latest Tweets widget for footer & sidebar. - Feature: Loading Speed optimizations & Autoptimize compatibility. - Feature: Sliders Parallax effect option. - Feature: A full-width gallery slider for post format Gallery. - Feature: Alternate style for popular posts Carousel at Home. - Added: Post Format icons in listings: Video, Gallery. - Added: Option to generate further images for loading speed. - Added: Configure related images number. - Added: 3 Column and 2 Column Related Posts. - Added: Circular image option for about widget. - Added: Limit slider to show posts by specific IDs. - Added: Slide/Fade animation option for large sliders. - Added: Speed optimization guide in documentation. - Improved: Subscribe widget for the footer area. - Improved: Comments on mobile. - Improved: TypeKit loader async for performance. - Improved: Masonry "Load More" for better aesthetics. - Improved: Demos on HTTPS now for imports on HTTPs sites. - Improved: Example Child Theme updated for efficiency. - Fixed: Jetpack compatibility for social sharing. - CSS Tweaks and improvements in over 60 areas. 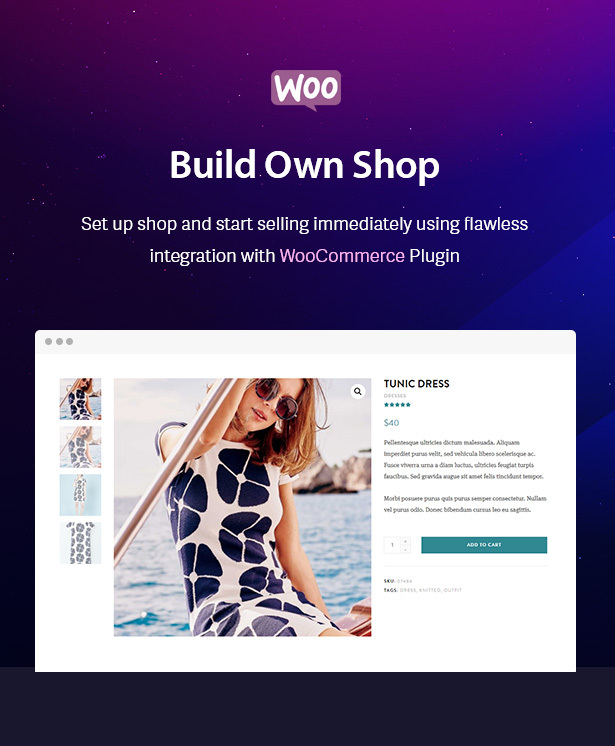 - Added: WooCommerce 3.0 Support. - Added: Image zoom on product pages. - Added: Slider for images on product pages. - Updated Visual Composer to latest version. ------------ - NEW SKIN & DEMO: Magazine. - Feature: Visual Composer support with blocks for Magazine. - Feature: New Grid Slider. - Feature: New Header Style 8 - Compact Header. - Feature: New Footer Layout - Classic Magazine. - Feature: New Post Style - Magazine. - Feature: 3 new homepage blocks. - Feature: Load More AJAX pagination on home blocks. - Feature: Numbered AJAX pagiantion on home blocks. - Feature: New Social Media with Counters widget. - Feature: Large posts style for posts widget. - Added: Smart Sticky for topbar/nav - sticky only when scrolling up. - Added: Post Meta Style C. - Improved: Widgets in all dark footers. - Improved: Performance - customizations are better cached now. - Fixed few minor CSS issues. - Feature: Added WPML multi-lingual compatibility. - Feature: Secondary topbar navigation support in Header Style 5. - Fixed: Large slider not affected by font change in some skins. - Fixed: Footer social icons for stylish alt. - Fixed: Text widget color in dark footer on skins. - Fixed: Added two missing translation strings. - Improved: Social Icon on Header Style 7. - Improved: Post cover layout on mobile devices. - Added: Grid posts title font settings. - Added: Category descriptions support. - Fixed: Post editor fonts and styling for skins. - Fixed: Ad widget code stripping for non-admins. - NEW SKIN & DEMO Beautiful Travel Skin & Demo. - FEATURE: New Stylish Alt Footer Style. - FEATURE: New Header Style 7 with Parallax. - FEATURE: A new stylish Carousel Slider. - FEATURE: Grid meta style can be different from global. - FEATURE: Limit by tag on posts widget. - Improved: More than 3 widgets in footer properly spaced. - Improved: Category widget hierarchy display design. - Fixed: Most liked sorting for posts widget in some environments. - Fixed: Rovella slider empty slide with more than 6 posts. - Fixed: Show category setting in posts widget for non-alt style. - FEATURE: Post "List Style 2" - a new listing style. - FEATURE: Header Style 6. - FEATURE: Stylish Dark Footer Style. - FEATURE: Alternate Posts Widget style. - FEATURE: A new slider named Grid Slider. - FEATURE: Options to show/hide elements in post footer. - FEATURE: "Home Page" page template for when using static home. - Added: Rovella in demo importer. - Added: Several new color options. - Fixed: Typography settings not affecting some parts of skins. - Fixed: Custom CSS not reflecting properly in live preview when using custom fonts. - Fixed: Comment count setting for meta style 2. * FEATURE: Lifestyle (nickname Miranda) Demo. * FEATURE: Gorgeous Full-width slider. * FEATURE: A new Footer layout option. * FEATURE: Header Style 5 with posts ticker & social. * FEATURE: Alternate grid posts style. * FEATURE: Alternate style for large posts. * FEATURE: Masonry feature for grid listings. * FEATURE: Alternate meta style for listings. * FEATURE: Numbered Pagination style option. * Updated: Instagram icon with latest FontAwesome. * FEATURE: Added an Easy Demo Importer. * Updated documentation on Mega Menu. * Fixed a vague checkbox for menus.